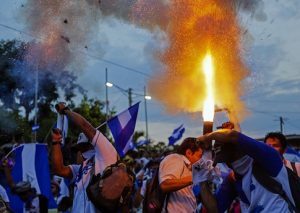 Human rights organizations in Washington and Nicaragua are documenting allegations of human rights violations following the deaths of at least 113 people protesting the Daniel Ortega regime in the political uprising that began two months ago, according to sources familiar with the investigations. A group of Nicaraguan college students traveled to Washington this week to ask for assistance from President Trump and Congress in toppling the regime. The students, who have emerged as the most effective opposition to Ortega, are sharing alarming new details about the deaths of fellow students killed in protests by national police. The students also are expressing concern that foreign actors from Cuba and Venezuela are helping the Nicaraguan government provoke violence among students attempting to hold peaceful protests against the Ortega regime, according to an attorney who met with the students. The lethal attacks against the students have become such a threat that the Catholic church issued a warning to priests and bishops who have sheltered the young people that their lives too are now in danger, the sources told the Washington Free Beacon. The Vatican News service also reported that the Episcopal Conference of Managua has denounced the death threats against bishops and priests, specifically bishops in the Archdiocese of Managua. Rep. Ileana Ros-Lehtinen (D., Fla.), an outspoken critic of the Ortega regime, has been a vocal advocate for the students. Ros-Lehtinen has been pressing the Senate to pass its version of the Nicaraguan Investment Conditionality Act, an effort to shut down Nicaragua’s access to international loans from the World Bank and International Monetary Fund. She authored a similar bill in the House, but the Senate legislation, coauthored by Sens. Ted Cruz (R., Texas) and Patrick Leahy (D., Vt.), has been stuck in the upper chamber. Secretary of State Pompeo responded on Thursday to the outcry from the Nicaraguan students and several members of Congress over allegations of intentional killings of student protesters by Nicaraguan national police and others supporting the Ortega regime. The State Department restricted the visas of several Nicaraguan officials, including those in the National Police, the Ministry of Health, and other municipal officials, for "directing or overseeing violence against others exercising their rights of peaceful assembly and freedom of expression, thereby undermining Nicaragua’s democracy." "The political violence by police and pro-government thugs against the people of Nicaragua, particularly university students, shows blatant disregard for human rights and is unacceptable," State Department spokeswoman Heather Nauert said in a release. The action prevents those involved with directing the violence from traveling to the United States. "These officials have operated with impunity across the country, including in Managua, Leon, Esteli and Matagalpa," Nauert said, declining to name the individuals impacted because of U.S. visa confidentiality laws. "We are sending a clear message: human rights abusers and those who undermine democracy are not welcome in the United States," she added. During a general assembly meeting of the Organization of American States on Monday, Pompeo used part of his speech to demand that the Ortega government respond to the Nicaraguan people's demands for democratic reform and "hold accountable those responsible for violence." A bipartisan group of U.S. lawmakers, led by Ros-Lehtinen and Sen. Marco Rubio (R., Fla.) earlier this week, wrote a letter to Trump urging him to sanction key Nicaraguan officials, including Francisco Diaz, the deputy commissioner of the National Police and "de facto director," for allegations of personal corruption under the Global Magnitsky Human Rights Accountability Act. Last month, Ortega sought to make unilateral changes to the country's social security program that, "because of corruption and mismanagement has been running a deficit," the lawmakers wrote. Massive protests erupted after news broke that Ortega would require employers to contribute a higher portion of workers’ salaries toward making up the gap, the lawmakers wrote. "In response, Ortega unleashed the government's National Police on these protesters," the lawmakers wrote. The lawmakers, citing media reports, also noted an incident on May 9, 2018 when a group of police officers attacked the residents of a small community in Managua. "Journalists who were covering the incident were threatened by 30 armed National Police officers," they said. "Francisco Diaz made a statement saying the police were only monitoring traffic and that four members of the patrol were hurt by bullets. Eyewitnesses denied his version of the story." "Elsewhere at least three students were allegedly killed for taking part in protests around the Polytechnic University and National University," they added. "The Associated Press confirmed the mobilization of police against the protestors. Francisco Diaz denied any policy presence in the area, according to the Washington Post." Besides Ros-Lehtinen and Rubio, lawmakers singing the letter to Trump included: Sens. Ted Cruz (R., Texas) and Bill Nelson (D., Fla.), along with Reps. Elliot Engel (D., N.Y.), Albio Sires (D., N.J.), Paul Cook (R., Calif.), Debbie Wasserman Shultz (D., Fla.), Norma Torres (D., Calif.), Michael Conway (R., Texas), Mario Diaz-Balart (R., Fla.), and Carlos Curbelo (R., Fla.).